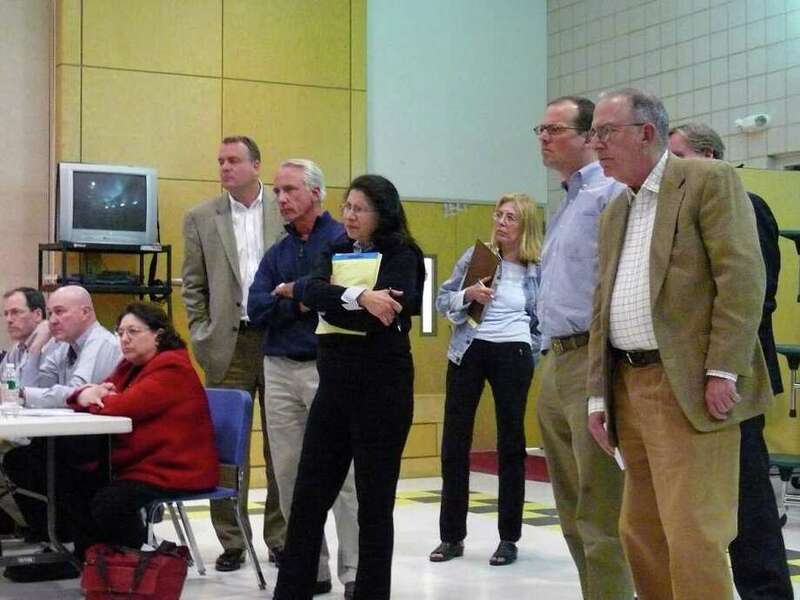 Residents from the Sasco Hill neighborhood look on as a proposed retail and commercial building is described at a Town Plan and Zoning Commission public hearing Tuesday. Sasco Hill neighbors got two public hearings for the price of one Tuesday night when the Town Plan and Zoning Commission reviewed applications to build two new buildings on the Post Road near Sasco Hill Road -- a medical office building and an office/retail building. The hearing concluded on the medical building proposed for vacant land at 2291 Post Road, but no vote was taken. Meanwhile, the on the retail building that would take the place of an empty building at 2307 Post Road constructed in the early 1900s was continued to May 24. Neither application, however, was looked on too favorably by the dozen or so neighbors at the hearing. "I've tried to meet with the neighbors and I've tried to work with the neighbors," said Bill Christian, the developer of the proposed medical building. "We tried to work with something that would be good for the neighborhood." But resident Mazie Zdanowich said the medical building project has "been going on for a long time," adding that the applicant did not talk to her, or any other Sasco Hill neighbors she'd spoken to about the proposal, despite claims that the applicant tried to work with neighbors on an acceptable plan. An application to build the medical building was approved in 2008, but never built because of the tough economy and the permit expired. Charles Jankovsky, lawyer for the developer, said this latest application would use a larger piece of property, but reduce the size of the building from 10,000 square feet to 8,000 square feet. "I was not contacted about this," said Sasco Hill resident Kevin Kelly, who questioned the applicant's survey about traffic. "All these assumptions are made that traffic on the Post Road is normal," Kelly said. "Traffic is never normal on the Post Road." Samuel Haviland, of Overhill Road, said many young children live on his street, so traffic is a concern. He added that he is concerned about the seeming "fluidity" of specific plans for the building. The second building being proposed for the area would be built at the corner of the Post and Sasco Hill roads. The existing building basically has a "continuous curb cut" along the building's frontage, according to architect Eric Michaels, who said when it was in use, cars backed out onto the Post Road. With the new building, there would be a driveway to the Post Road, as well as another onto Sasco Hill for those who want to take advantage of the traffic light regulating traffic flow at the intersection. In addition to parking in front of the building, there would also be underground parking. William Fitzpatrick, the applicant's lawyer, said the application meets all zoning regulations, is a permitted use and would not affect the current level of service for traffic. Neighbors did not get a chance to comment before the commission's 11 p.m. curfew.